In this post, I will discuss the regalia used during the coronation ceremony which is traditional held at Westminster Abbey in London, England. (For information about the remaining items in the collection, please check out the Crown Jewels of England (Part Two). Britain is the only European monarchy to still use regalia for the consecration ceremony of their king or queens and these are considered the main items of the Crown Jewels collection. The coronation ceremony of the English monarch has taken place in Westminster Abbey since William I was crowned in 1066. At the time of his coronation centuries ago there was an older smaller church on the site in the City of Westminster (London) prior to the current large Gothic cathedral. Most people will recognize Westminster Abbey as the place where Prince William, the Duke of Cambridge married Catherine Middleton in April 2011. During the coronation ceremony the Sovereign will wear several different robes and garments. The first item of clothing is normally a crimson surcoat and is worn for the duration of the ceremony under all the other robes. 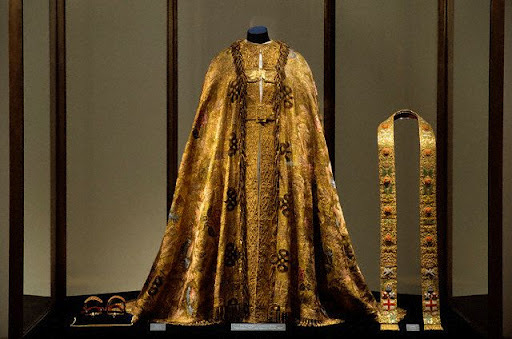 The Sovereign will enter Westminster Abbey wearing the surcoat under the Robe of State. In 1953, for her coronation Queen Elizabeth II worn a specially made gown designed by Norman Hartnell instead of the surcoat. The Royal Maces – There are sixteen royal maces in the Crown Jewels collection but only two are carried into the Abbey on coronation day. Originally royal maces were used as protection weapons for the king’s sergeant of arms and later they developed into ceremonial staffs that represent royal authority. The maces are approximately 5 feet in length and the head of each is decorated with the royal arms, cyphers and symbols of the rose, thistle, harp and fluer-de-lys. The Three Ceremonial Swords – There are a total of five swords used in the coronation ceremony. 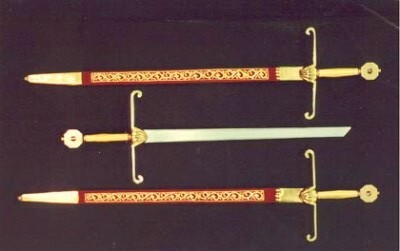 Three swords are used during the coronation procession into the Abbey; they are the Sword of Spiritual Justice, the Sword of Temporal Justice and the Sword of Mercy. The swords were originally made for Charles I coronation and are among the few items of the crown jewels that survived and were not melted down by Oliver Cromwell. The first two swords symbolize the Sovereign’s relationship with the church and the state. The third sword, known as Edward the Confessor’s Sword, has a blade that is broken and squared. This sword represents the quality of mercy and according to legend the tip was broken off by an angel to prevent a wrongful killing. The Sword of State – This sword is the largest in the crown jewels collection and is carried during the procession into the Abbey and later exchanged for the Jeweled Sword of Offering during a later portion of the coronation ceremony. The sword dates back to 1678 and has a steel blade with a wooden velvet covered scabbard which is decorated with silver gilt floral symbols of the United Kingdom and features a crosspiece in the form of a lion and a unicorn. The Sword of State is also carried during the State Opening of Parliament. St. Edward’s Staff – The original staff is traditionally thought to have been used by Edward the Confessor, but it did not survive when Oliver Cromwell melted down most of the crown jewels. In 1660 it was recreated for the coronation of Charles II and is carried in the procession but has no official function in the coronation ceremony. The plain gold rod comes in three sections with a steel spike at the end and is 56” in length and weighs 55 ounces. 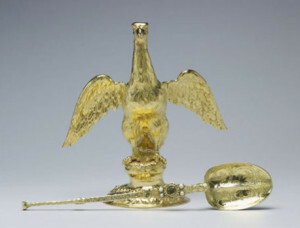 The Ampulla – which dates back to 1661, is a golden eagle flask which holds the consecrated holy oil which is poured into the coronation spoon to anoint the Sovereign. The Coronation Spoon – The silver gilt spoon decorated with pearls is the oldest piece and dates back to St Edward coronation in 1349 when it was first recorded as part of the regalia. The Supertunica – The Supertunica was made for the coronation of George V in 1911 and has been worn by George VI and Queen Elizabeth II. It is full length long sleeved gold silk garment which opens in the front and is lined with red silk which is fastened with an embroidered belt with a gold buckle decorated with roses, thistles and shamrocks. The Stole – The Stole is worn over the Supertunica and is a long narrow band of gold silk, lined with red silk and fringed ends. Originally made for the coronation of Queen Elizabeth II in 1953, the Stole is embroidered in gold and colored threads and designed with symbols of the United Kingdom and Commonwealth. The Imperial Mantle – The Imperial Mantle was made for the coronation of George IV in 1821 and is designed in the style of earlier ones worn by the Tudor and Stuart monarchs, it is worn over the Supertunica and the Stole. The Imperial Mantle is made of gold cloth, lined with red silk and woven with colored threads designed with a pattern of crowns, eagles, fleur-de-lis, roses, thistles and shamrock held together at the chest with a gold clasp in the form of an eagle. The Jeweled Sword of Offerings – This sword is the only one actually presented to the Sovereign by the Archbishop of Canterbury during the coronation ceremony. Originally made for the coronation of George IV in 1911, the blade is made of steel with the hilt and the scabbard decorated with thousands of precious stones of diamonds, rubies and sapphires. The Spurs – The Spurs date back to 1661 and were made for the coronation of Charles II. Currently the Spurs are presented to the Sovereign to represent knighthood and chivalry; for the coronation of Queen Elizabeth II the Spurs were briefly presented to her, never worn but symbolically placed on the altar. The golden spurs are each designed with Tudor roses with a spike in the center and narrow velvet straps are attached to the buckles with gold embroidery thread. The Armills – The Armills are symbolic of the Sovereign’s sincerity and wisdom. For the coronation of Queen Elizabeth II, she was presented with 22 carat gold Armills that are lined in red velvet with Tudor rose clasps as a gift from the Commonwealth governments. The Orbs – There are two orbs in the crown jewels regalia, the Sovereign’s Orb and Queen Mary II Orb. During the coronation ceremony, the Sovereign’s Orb is presented by the Archbishop and placed in the Sovereign’s right hand to represent supreme power and independent authority over the country; it was made for Charles II coronation in 1661 and has been used in all subsequent coronations. The Orb is a golden hallow sphere 6.5” in diameter and decorated with a band of precious stones and pearls across the center and a half-band across the top. As the Sovereign leaves the Abbey after the conclusion of the coronation ceremony the Orb is carried in their left hand. The Queen Mary II Orb was made in 1689 for the coronation of William and Mary who came to the throne of England as equal King and Queen and reign jointly. Two sets of regalia were needed for their coronation and this second orb was made for Queen Mary II and is smaller in diameter at 5.75” and is also decorated with precious stones and pearls. The Coronation Rings – There are two different coronation rings in the regalia, the Sovereign’s Ring and the Queen Consort’s Ring. During the coronation ceremony, the Sovereign’s Ring is place by the Archbishop on the fourth finger of the Sovereign’s right hand and represents kingly dignity. The ring was originally made for the coronation of William IV in 1831 and has been used at the subsequent coronations from Edward VII through Queen Elizabeth II. Queen Victoria had very small fingers so an exact replica of the Sovereign’s Ring was made in a smaller size for her coronation. The Sovereign’s Ring is an octagonal sapphire set in gold with an overlay of four rectangular cut and one square cut rubies finished with a border of diamonds and an additional diamond on each side of the band. The Queen Consort’s Ring was made for Queen Adelaide in 1831 for the coronation of her husband William IV and has been worn subsequently by Queen Alexandra, Queen Mary and Queen Elizabeth the Queen Mother. The Queen Consort’s Ring is a rectangular ruby set in gold surrounded by diamonds with smaller rubies decorating the sides of the band. The Sovereign’s Sceptre with Cross – This sceptre, which symbolizes temporal power, is presented to the Sovereign near the end of the coronation ceremony and is held in their right hand. The Sovereign’s Sceptre with the Cross was originally made in 1661 for Charles II. For the coronation of George V it was redesigned to incorporate the Cullinan I which is the largest flawless cut diamond in the world at over 530 carats. 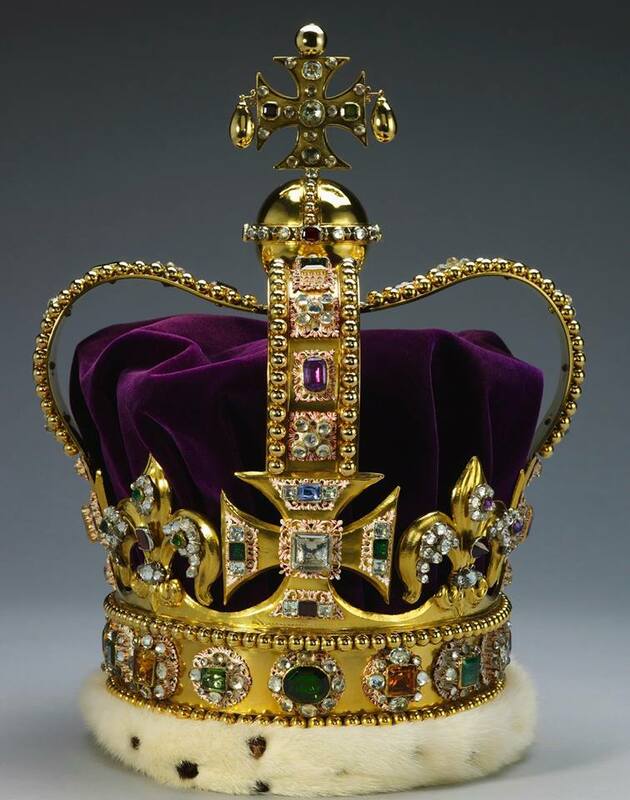 (For additional information about the spectacular Cullinan diamonds used in the Sovereign’s Sceptre and the Imperial State Crown, please check out the Crown Jewels of England (Part Two). The Sceptre with the Dove – The Sceptre with the Dove symbolizes spiritual power and is presented to the Sovereign to be held in their left hand. 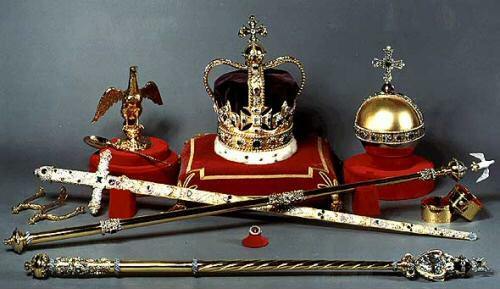 Two additional scepters in the Crown Jewels regalia collection were used for the coronations when a queen consort is crowned, these include the smaller Queen Consort’s Sceptre with Cross and Ivory Rod Dove. Finally the dramatic end of the coronation ceremony is when the Archbishop of Canterbury approaches the Sovereign, and solemnly holds the St. Edward’s Crown high for a few brief moments and then reverently places it upon the Sovereign’s head. This act constitutes the actual crowning of the Sovereign who symbolically takes possession of the kingdom and then receives the homage of the other royal members, peers and clergy who have gathered in Westminster Abbey to witness the coronation ceremony. The St. Edward’s Crown – This crown is one of the most important pieces of the coronation regalia and was originally made in 1661. The St. Edward’s Crown is a solid gold frame formed in a circular designed with four crosses, four fluer-de-lis with two crossing arches topped with another cross. 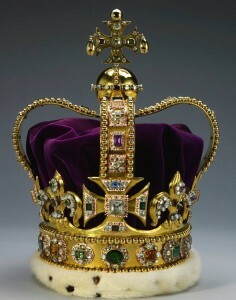 The crown has 444 precious stones, including diamonds, sapphires, amethysts and topazes; and weighs almost five pounds. For more information about some of the remaining items in the royal collection, please check out the Crown Jewels of England (Part Two) which goes into details about such items as the Imperial State Crown, the George IV State Diadem, the Crown of Mary Modena, Queen Victoria’s small diamond crown and the Crown of Queen Elizabeth. Other items in the collection also include several tiaras, necklaces and earring sets and a variety of pins worn by the previous British Royal family. This entry was posted in Miscellaneous and tagged Ampulla, Barbara Jones, Coronation regalia, Coronation Spoon, Crown Jewels of England, Edward's Staff, Enchanted Manor, Imperial Mantle, Monthly post, Queen Elizabeth II coronation dress, Royal Maces, Stole, Supertunica, Sword of State, The Enchanted Manor, Three Ceremonial Swords used in coronation by barbara. Bookmark the permalink.